Although so far central Pennsylvania has had a mild winter, seasonal weather conditions are still a concern for those living in the area. 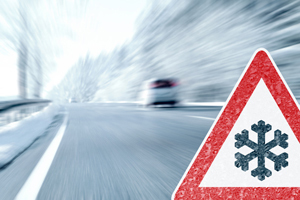 To keep you safe on the road, we have compiled a complete guide of winter driving tips. Checking the tread and depth of your tires is possibly the most important precaution you can take to prevent winter driving accidents. Even if your tires have recently passed a state car inspection, the tread can be worn enough to prevent proper traction on an icy road. While 2/32 of an inch is widely recommended as the standard indication for tire replacement, it is also recommended that 4/32 of an inch be the standard for winter driving. A tire pressure gauge should be included in your emergency car kit (see below). However, if you do not own one, you can easily check your pressure at air pumps provided at most gas stations. Most tires provide the recommended PSI on their sides. You may have heard the myth that low tire pressure is actually better in icy conditions. However, low tire pressure can cause serious damage to your tires and your car, and is not recommended. According to CBSnews.com, stopping in wintry conditions can take up to 9 times longer than in ideal conditions. Be sure that your brakes are in good condition before venturing out in the snow. Check your vehicle’s levels of coolant / antifreeze and windshield wiper fluid. Visibility is an important, but often overlooked aspect in winter driving. Be sure that your wipers are not damaged and that they perform as intended. Be sure to check all lights: headlights, high beams, turn signals, brake lights and tail lights. Batteries may struggle in colder weather. Have your mechanic test your battery’s charge. Some auto parts dealers offer this service for free, or you can purchase a multi-meter to check the charge yourself. Before heading out, let someone know where you are going and when you expect to arrive. Also, be sure that there is no ice or snow blocking your exhaust pipe. Finally, try to keep your gas tank full, as you may need to use the engine as a heat source in the event that you become stranded in your car. If you decide to drive in winter weather, only drive at a speed at which you are comfortable. Maintain a good distance between your vehicle and other cars. Remember that four-wheel drive does not mean that you have extra stopping power. Avoid using cruise control and always use your headlights. If you find yourself sliding, it is helpful to know whether your car has rear-wheel drive or front-wheel drive. Rear-wheel vehicles should turn toward the slide, while front-wheel drivers should turn in the direction in which they want to go. If you become stranded, you can use your engine as a heat source. However, only turn the engine on once every hour for 10 to 15 minutes, and be sure that your tailpipe is free of ice and snow. If you’re involved in an accident due to weather, don’t hesitate to call the KBG Injury Law team at 717-848-3838 or fill out our online contact form. We are dedicated to getting you the Results You Deserve®.